To provide your customers with timely responses, you can customize your alerts and be notified when a new review has been written or an older review updated. Log in to your Trustpilot Business Account. Point to your name and, in the drop-down menu, select Notifications. You have several notification options to choose from. Select the notifications that are most relevant to you, then select the Save changes button. You can send copies of all review notifications to an external email address. You might want to do this to keep someone in your company who doesn't have access to Trustpilot Business, like a PR or Communications manager, up-to-date on the reviews that you receive. Under Notifications, in the Email colleagues about new reviews section, enter an email address in the email address box, then select the Add email address button. To remove a recipient from the notifications, select the Trash icon to the left of their email address. It's important to remember that anyone whose email address is added using this feature will receive a copy of every notification that's sent to all business users. 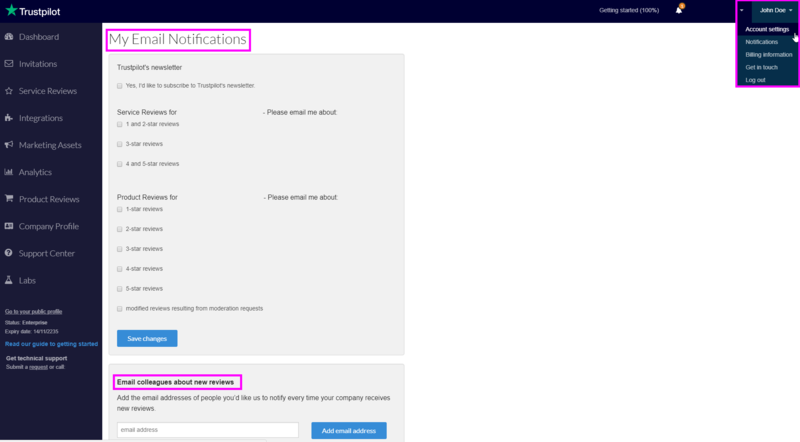 Note: Business users can manage their own notifications, so you shouldn't send them copies of notifications using this feature. You should also note that you might need to upgrade your account to use this functionality.